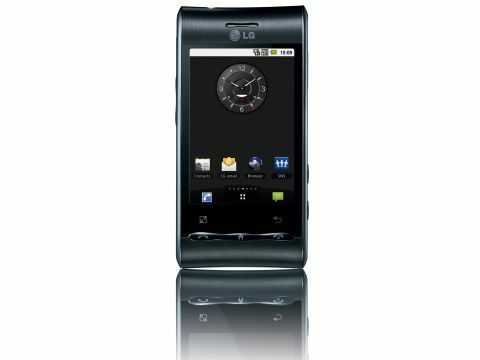 The LG Optimus GT540 is LG's latest shot at an Android smartphone, and the company's second to hit the UK. The last Android offering – the inTouch Max GW620 – came with a slide-out keyboard, but this time the keyboard has gone. Aimed at the middle range market, the Optimus GT540 comes in at about £150 on PAYG and we found it free on contract for as low as £15 a month. Can it do enough to show Android off to the best of its powers, do the platform proud and please its intended market at such a low price? In terms of look and feel, the LG Optimus GT540 punches above its weight. The curvature of the top and bottom edges, and the faux brushed-metal finish look rather good. We like the waved panel where the Call, End/Power and Home buttons sit, too, as it's noticeably different from the norm. When it comes to internal specs, it is worth pointing out that the LG Optimus GT540 runs Android 1.6. That makes it very out of date in terms of the Android OS, and cuts out a whole swathe of potential goodies for users – although the core of Android is here, of course. The LG Optimus GT540 is fairly small for the hand, weighing in at 109 x 54.4 x 12.9mm, and it shouldn't be a challenge to reach all the way across the 3.2-inch screen one-handed. The screen is clear and bright, but sadly it's resistive, and far from being the best of its type to come our way. We didn't have to press too hard to make a connection (although it is annoying having to remember to over-press, although we guess that will become second nature eventually). The same can be said for the two touch buttons under the screen – the Android back and menu buttons are touch sensitive, and can be a little inaccurate at times. LG has kindly added a 3.5mm headset slot in the top edge of the phone, where it sits surprisingly comfortably in the curvature of the chassis, and the bottom edge is clear of any ports or connectors. On the sides you'll find the usual array of buttons in the shape of a volume rocker on the left and a camera button on the right. The micro USB connector is also on the right. One oddity is that the right side also contains the Android search button. Tap this to get context sensitive searching options. We can sense that its positioning might irritate some users, but we didn't find it a problem at all.